Hier soir, a bunch of colleagues and I went to Bar Lola on Commonwealth Avenue to say our good-byes to a former colleague. I have to say that Bar Lola is one of the most underrated Tapas bars in Boston. The sangris are probably the best in the city, food is off the chain, the atmosphere is super cozy, location is amazing, and the service is fantastic! We reserved the back room for our party which was a brilliant idea. We had the entire space to ourselves, privacy, a little dance floor, and of course awesome company. I think the reason why Bar Lola may not be as popular as it should be is because it's underground, which normally freaks me out, but in this case it's totally doable. Anyway, I don't have too much more to say because for the first time I am not complaining or bitching about a place. 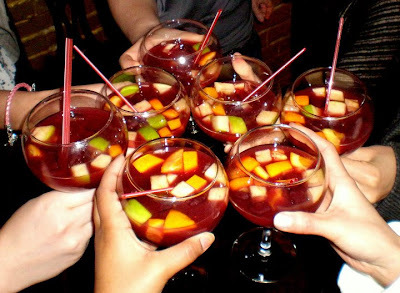 I highly recommend Bar Lola for their sangrias, Tapas menu, and Salsa gatherings on Wednesday nights. 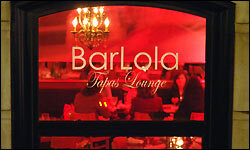 Bar Lola is an amazing daytime lounge in the summer with their outdoor patio that looks over the beautiful Back Bay.